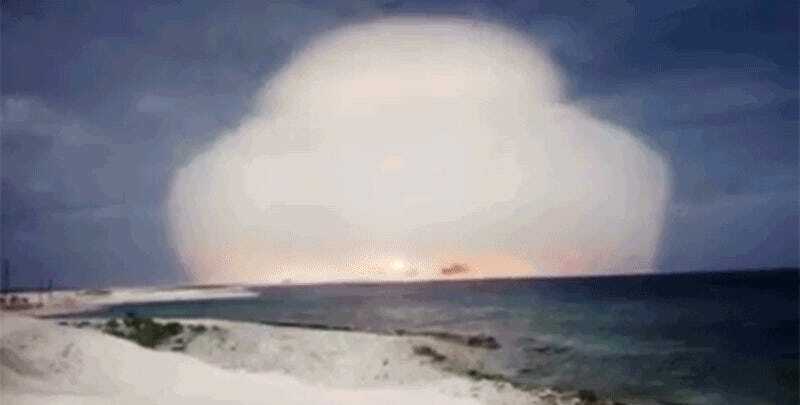 From 1945 until 1962, the United States conducted 210 atmospheric nuclear tests—the kind with the big mushroom cloud and all that jazz. Above-ground nuke testing was banned in 1963, but there are thousands of films from those tests that have just been rotting in secret vaults around the country. But starting today you can see many of them on YouTube. Lawrence Livermore National Laboratory (LLNL) weapon physicist Greg Spriggs has made it his mission to preserve these 7,000 known films, many of them literally decomposing while they’re still classified and hidden from the public. “You can smell vinegar when you open the cans, which is one of the byproducts of the decomposition process of these films,” Spriggs said in a statement to Gizmodo. It’s a race against time, and Spriggs figures it will take at least another two years to scan the remaining films. The declassification of all the remaining 3,480 films, a process that requires military review, will take even longer.